Six routes have been established across Normandy which lead in from various parts of France and Europe. To introduce you to these trails, the association organises a walk at the end of September each year with a number of events along the way (exhibitions, tours, discussions, concerts…). Follow in the footsteps of the English pilgrims who used to set off from Winchester Cathedral. Arriving in France they took either the inland route from the port at Barfleur or the coastal route from the port of Cherbourg. You could also take the English part of the trail following the Pilgrims’ Trail. This is 45 km long (28 miles) linking Winchester Cathedral with Portsmouth. See the guide available from Hampshire County Council. For further information, contact: Hampshire County Council, Information Centre, High Street, Winchester, Hants, SO23 8ZB, United Kingdom. Follow one of the ancient main routes which led to Mont-Saint-Michel from Paris, capital of the French kingdom, or from the cathedral of Notre-Dame in Chartres. Saint-Hilaire-sur-Erre (in the Perche, a few kilometres from Nogent-le-Rotrou) to Mont-Saint-Michel on the Chartres route. Full reinstatement is planned for 2009. Until then, contact the association for suggested routes linking Chartres and Paris with Mont-Saint-Michel. Follow the routes taken by Norman pilgrims in their thousands across the old Duchy of Normandy. The Caen route opened in 2001 and Rouen route was inaugurated in 2004. Les Chemins des Ducs de Normandie. 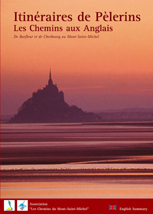 In order to link these two great sanctuaries, the association Chemins du Mont-Saint-Michel has signed amical accords with associations of the Friends of St Iago de Compostella in Anjou, Brittany and Normandy. Today there are two routes linking Mont-Saint-Michel with Saint-Jean-d’Angély where they join the route from Tours to St Iago de Compostella. The first of these crosses Brittany and the Vendée via Pontorson, Rennnes, Nantes, Montaigu and Surgères. The second goes via Saint-James, Fougères, Vitré, Pouancé, Angers, Le Puy-Notre-Dame, Parthenay and Niort. These two routes are way-marked in both directions. Those heading south to St Iago (the Jacquets) follow the Compostella ‘scallop shell’ signs and share the trail with those heading north to Mont-Saint-Michel (the Miquelots) who follow the Saint-Michel logos. Owing to popular demand for greater knowledge of pilgrimage and the cult of St Michael, the association organises a bi-annual day-long conference on the Spring St Michaels Day (8 May). The findings are published by the association the following year.